Proved 1. Loudoun Hill fort; 2. Largs to Bishopton. Possible 1. Irvine valley; 2. Loudoun towards Barochan; 3. Muirkirk to Douglas and Muirkirk to the Nith Valley; 4. the Nith valley north towards Cumnock and Hurlford, near Kilmarnock; 5. the Dee and Ken valleys north towards Dalmellington and Ayr; 6. the Kirkmichael area; 7. a north-south coastal route; 8. Ayr to Irvine Valley; 9. Cree Valley to Girvan; 10. Girvan to Castledykes ; 11. Irvine to Barochan, Balmuildy. Unproved 1. Loudoun towards Muirkirk; 2. Avisyard to Doon Valley. In 79 AD, the Romans under Agricola invaded Scotland and advanced as far as the Tay. The following year, forts were established on the Clyde-Forth line and areas already over-run consolidated. It is possible that the Loudoun Hill fort was established then with only a limited incursion beyond this and the same to the south in the Nithsdale area. In 81 AD, Agricola moved troops into the west and south-west and investigated the possibility of a west coast invasion route as well as an invasion of Ireland. The year after that he led his forces northward up the east coast until his victory at Mons Grapius in 83 AD. This was followed by a period of consolidation (the Flavian period) but troops had to be transferred from Britain to the Balkans to make up for losses and this led to a gradual withdrawal over the next few years to the Tyne-Solway line, certainly by the turn of the century. In 142 AD, they readvanced (the Antonine period), this time to the line of the Clyde and Forth where they built the Antonine Wall. Loudoun fort was reoccupied and fortlets and a road in the Greenock - Largs area were built. Again, they stayed for about 20 years but withdrew to Hadrian's Wall in the 160's with the exception of some forts in the south west from which patrols could be mounted. While these periods of 20 years or so sound very little in the context of the 400 or more years the Romans were in Britain, they would have been long enough to build roads in the area and thoroughly affect the lives of the local population. An idea of how much they could have built is given by William Taylor in his work The Military Roads of Scotland (p.97): the normal rate for the soldiers working on the military road to Portpatrick in the 1760's was at least 1 1/2 yards for a nine-hour day. 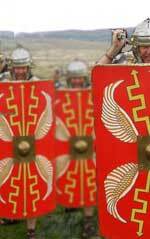 This means that 1000 Roman soldiers could have built one mile a day, and perhaps up to 100 miles in any one year. As the network of actual and probable Roman roads in Scotland is about 400 miles in length, it can be assumed that their construction could easily have been completed in a relatively short time within the overall period of occupation; and no doubt, the construction of other roads still to be discovered. The only other Roman incursion was that of Severus in 209 AD (the Severan period) but this was directed at northern tribes and did not affect the Ayrshire area. Patrols may have continued in the south west until the 290's but after this time the increasing activity of the northern tribes and the Irish made even this impossible. It has to be remembered that this period was still the Iron Age or the age of the Celts. The Damnonii and Novantae were still there and continued in a recognisable form into and through the Dark Ages, i.e. the period after the Romans left Britain. They still had their settlements and carried out their normal activities as much as they could in what must have been difficult times. Their network of routes, whatever it was, continued to exist and would have been used by the Romans when they entered the area. The question is, whether the Romans consolidated this network by using it for their roads and extended it by constructing new roads or whether they bypassed Ayrshire and built hardly any roads at all. One such theory suggests that the Romans did not in fact occupy the whole of Ayrshire, having written off the territory of the Novantae as not necessary for their purposes. The line of the Solway road would show the southern limes or border with the forts at Gatehouse and Newtown Stewart guarding the hills to the north; to the east and north would be the Nith Valley road and forts with a link to Loudoun Hill. (1) Even if this theory is correct, it does not mean the Romans were never in Ayrshire. Clearly they were, as witness the marching camps at Girvan. It is reasonable to assume a widespread infiltration of the area and these lines of march could well approximate to the various routes detailed below. Over the years, historians and archaeologists have tried to identify possible Roman roads in Ayrshire. A review article by Allan Wilson (2) is particularly useful in detailing this work. Although many possible routes have been put forward only two have been universally accepted, viz. the route from Castledykes in central Lanarkshire to the fort at Loudoun Hill and perhaps onward to Irvine (no.1 below) and one at Outerwards above Largs (no.2 below). Others again although not proven are worth serious consideration while others are almost certainly not Roman. In fact, it is very difficult to have a road recognised as Roman unless Roman finds or structures such as a camp are clearly associated with it. The following list then should in no way be taken to imply that Ayrshire had an extensive network of Roman roads. It is merely a reasonably comprehensive overview of what has been proposed, with some indication of those roads that might be Roman. It is as well to remember the distinction between lines of march linked to the actual invasion and actual roads built in a period of consolidation. They could coincide, i.e. a road be built along a line of march but not necessarily so. Examples would be the marching camps at Girvan, and the camp at West Newton near Strathaven, which could imply a north south march from the Muirkirk area, rather than east west as implied by the Loudoun Hill road. This means that some of the routes mentioned above may indicate lines of march rather than actual roads. A known Roman road runs from Castledykes in Lanarkshire towards the fort at Loudoun Hill. It can be clearly seen today south of Stonehouse and at the time of the Military Survey of Scotland around 1750 could be traced as far as Westlinbank, south-west of Strathaven. Surprisingly it hasn't been traced beyond this point to the fort although it undoubtedly existed. It has been conjectured by many that it continued onwards to Irvine but no definite traces have been found. There was a patrol track a couple of miles to the west of this road. Its course in Ayrshire was Blackfield Loch, Fardens and Outerwards where it rejoined the main road. This took an almost straight track from Loch Thom to Berry Hill and Outerwards and then to Blackhouse Moor, Brisbane and Largs. There are quarry pits and holloways on the Blackhouse Moor ridge, and a spur road that led over the Noddsdale Burn to Girtley Hill and possibly to Gretco Bridge. The make up of these roads varied along their length but were approximately 15 feet wide, often on an agger or on a terrace and sometimes with ditches still to be seen. When crossing boggy ground brushwood was laid on upturned peat and the road material on top of that. As mentioned above, it is thought likely that a road ran from the Loudoun Hill fort towards Irvine where there may have been a fort and where the Damnonian tribal centre of Vindogara may have been located. No traces have been found although the entry for Galston parish in the New Statistical Account says that the old Roman road can still be seen on the other (north) side of the Irvine. An old road was examined north of Newmilns in 1960 but no definite date was attributed to it. (5) The road is on Dalwhatswood Farm and is twelve feet wide with kerbstones and gravel and small stones laid on a base of larger stones. Newall (6) suggests that "Wallace's Fort" on the east side of Loudoun Hill could be a Roman fortlet, referring to the N-S alignment of holloways and a wide cobbled substratum exposed on the Irvine's banks 200 yards upstream from the location. Newall, Lonie and Sinclair reported a possible road from Loudoun Hill north over the moors which may have led to the fort at Barochan. (7) Its course is Newlands, Tongue, Lamb Hill, Low Overmoor, High Overmuir, west of Crook Hill and Myers Hill, Carrot Burn and Loch Hill. The road was traced to NS566468 but there are traces suggesting a continuation to Greenfield and Ballageich, and its general direction suggests Barochan as the terminus. It is close to the course of the track between High Overmuir and Crook Hill but separate from it. Its construction is of clay and road metal and is approximately 5.5 metres wide. This is the continuation of a road that Newall and Lonie thought ran to Muirkirk from Loudoun Hill but was not accepted by the Ordnance Survey as Roman (see next section, road 1). From Muirkirk, it appears to continue south along the rough line of the proposed Muirkirk - Sanquhar turnpike (8) although it deviates from this in many places. Just south of Pepper Hill, the road bifurcates. One leg passes into Lanarkshire heading east towards Tinto via the south slopes of Mid Hill, Auchendaff Hill and Hartwood Hill and then towards Parkhead Hill above Douglas. The other heads to Connor Hill (perhaps from conaire, Gaelic for a path), East Fordibban Hill, Black Hill, Crook Brae, Craigdullyeart Hill, Edge Hill, Airds Hill and Avisyard Hill. The road is between 7 and 8 metres in width, again of clay topped with gravel, and in places covered with over two metres of peat. Clarke (9) in a study of the Nithsdale route suggests a possible road from the fortlet at Bankhead, near Kirkconnel, on the terrace above the Nith. This would avoid the valley bottoms and slopes where ambushes would be easy. He describes a possible stretch of Roman road at Glenn, near to a suggestively named house called Street. This is 16 feet wide with a bottom of large cobbles, and 24 feet wide when side ditches are included. The line he suggests is Glenmucklock, Crichtons, Hillhead and Bankhead. Wilson studies the same route. (10) He noted there was a road 70 yards from the fort and reckoned that it could have headed for Corsencon Hill along the route suggested by Clarke. Alternatively, it could have followed a route west of this, aligning with the old parish road from Mach to Street at Corsencon Farm. From here, it would have avoided low ground and Avis Hill and may have headed for Avisyard Hill where there was a long tradition of a camp. One possible route would be via Mounthope and the ford at Muirfoot Burn, the other through Iron Gates near Glen Farm and Grieve Hill Colliery at Watsonburn. This latter route contained the section examined by Clarke but Wilson reckons that the sharply scalped margins are a strong indication that it is an old coal road superseded by the one constructed by Sir Charles Stuart Menteith. This ran over the back of Corsencon Hill to the "inclined plane" where waggons could trundle down towards Kirkconnel under the influence of gravity. He admits however that it could be a Roman road remade at that time. Lonie and Newall (11) deal with two stretches of possible Roman road which could be a continuation of the Bankhead - Hillhead - Glen route. From Glen it was traced to Mounthope heading west towards the Muirfoot Burn. Two miles further on a stretch of road runs from NS612159 to just above Lowesmuir, passing to a stream crossing where there are holloways running to a ruined bridge which may be 18th century. Its course would follow the present parish boundary and link to a short stretch of reputed drove road near Avisyard. Beyond that point, it could have continued north towards Hurlford. Wilson (1995) suggests a possible crossing of the Lugar in Cumnock where there are massive sandstone blocks incorporated in the A76 bridge. Clarke and Wilson (12) sought to establish the northward route by looking at crossings over the River Cessnock and the River Ayr. At the Cessnock they looked at two holloways (sunken paths where the track has been eroded by the passage of traffic) just west of Howford Bridge but discarded these in favour of another more in line with the river. The Cessnock had been crossed at a ford (NS476328) and at an earlier bridge, remains of which were visible east of the ford and west of the 1840's Howford Bridge. They excavated south of the track leading from the main road to Carnell and found four roads running north-south. These were a Macadam road, a high-cambered earlier 18th century road, an older road bottom of smallish cobbles and a very worn road with a slight camber and a bottoming of large stones. The Macadam road was very close to the main road and ran to the earlier bridge and illustrated the Macadam technique of using small stones directly laid onto the ground, a slight camber, and shallow ditches. The early 18th century road was 12 foot wide of loose gravelly earth and smallish cobbles at the base. It may be the road shown on Roy's map of c.1750. The third road was 16 foot wide with kerbs of large stones, a bottoming of large cobbles and a cover of compacted small stones. They considered both these roads to have been 18th century and to have run to the west, as there was no trace of either 200 yards to the south. The fourth road lined up with the ford that Lebon (13) says was used by the Dumfries road in the 17th century. They looked at two holloways that led to adjacent fording points. One to the west was large and deep with no signs of modification but the other, which was 12 foot wide, had a bottoming of large cobbles and was traced on the other side of the river. They reckoned the smaller ford and road were older than the larger, possibly mediaeval track. In trying to trace the route to the south, they could only find the Macadam road at Bargower (cutting out the bend of the 19th century road) and no traces as far as the water tower to the north of Mauchline. However, in the field just south of the water tower on the line of the main road before the bend there was a very decayed road 14-foot wide with ditches and a cobbled bottom. This was aligned to the ford on the River Ayr (NS503254) along a holloway 100 yards to the west of the ford. On the south side of the ford, the holloway was 34 foot wide with a 13-foot wide bottom laid with river cobbles. Cuts in an adjacent field showed a 9-foot wide loose cobbling scattered at the edges, along with a crop mark. Just north-west of here there is an interesting instance of the placename Cauldcot, in this case Cauldcothill. In his book on Roman Roads, Codrington (14) says that Coldcotts or Cauldcotts is invariably found beside a Roman road. It had the meaning of cold cottages or cold harbour where travellers could take respite from the weather or pass the night. It may refer to the north - south road being discussed here or even one from the Galston area towards Ayr. Certainly, the high ground would be reasonable for the placing of a road. As a matter of interest for those who find difficulty in the idea of this placename being a pointer to a Roman road there is an example from just over the border in Lanarkshire at Cauldcotts Farm near Strathaven which is passed by the Loudoun Hill road. If a road did head for Hurlford, Wilson (2) suggests two routes beyond the ford. One would have led to the Beansburn ford on the Crawfordland Water and then to Fenwick and along the Kingswell Burn to Kingswell where the pre-turnpke ran to the north of Drumboy Hill towards Mearns. The other route would have ran from Kingswell on the line of the Eaglesham Moor Road (B764), which had been mapped by Roy, and perhaps headed for the fort at Bothwellhaugh. Newall reports a road near Kirkmichael. (15) It is 7 - 9 metres wide with a camber and runs from north of Barshean Loch towards Drumbuie and to the south of Dryrock Hill. It probably continues towards Orchard towards the Drumore ridge. As Barshean Loch is only two miles from the Ayr-Dalmellington road it may well have led from this. With the discovery of Flavian marching camps at Girvan (NX190990 and NX186990), it is clearly possible that there was a route along or near to the coast. Wilson (2) notes that the pre-turnpike runs from Auchencrosh through Glenapp Castle grounds, crossing the Stinchar below the castle. An interesting unclassified road runs past the standing stones of Garleffin. North of Ballantrae the pre-turnpike kept to the line of the A77 as far as Bennane Lea (NX093859) when it swung round the back of Bennane Head to Balereuchan Port. The difficult Kennedy's Pass was avoided between Pinbairn Burn and Ardwell. From here to Girvan, the A77 could mark a Roman line. For this section, St Joseph suggests a coastal route. No evidence of a Ballantrae - Girvan route via the Stinchar valley has been found. Between Girvan and Ayr, Wilson suggests that the pre-turnpike shows no evidence of Roman engineering. Nor are there signs of a road along the higher ground to the east. Newall and Lonie (16) suggest a route along the Girvan Water from Dipple through Purley hill and Threave towards Low Burncrooks. The route suggests a Doon crossing or perhaps a link with the possible stretch near Kirkmichael at Drumore. From Irvine towards Largs, Wilson notes that a Roman road would probably have followed the pre-turnpike to the ford at Kilwinning thus avoiding the Bogside mudflats and then perhaps turning towards the coast at Stevenston and Saltcoats although he notes that there is no evidence to substantiate this. There were settlements in this area from the earliest times. From Saltcoats the pre-turnpike followed the coast but veered inland at Seamill on a higher line than the present road. South of Largs, at Fairlie, Newall and Lonie (18) found a stretch of road, which may be Roman. There have been a number of finds in the Largs area. Newall and Lonie (19) propose a different line from the Kilwinning area. The road they found runs from Lochwood just north of Kilwinning (Lochwood) to Muirslaught, Meikle Ittington, just above Knowewait to Blackshaw Hill then past Drummilling above West Kilbride. It then runs past Thirdpart to swing around Goldenberry Hill to terminate near Stoney Port on the coast. They believe there was a substantial harbour with a pier over 50 metres in length at this location but this may have been a fish trap (see Virtual Hunterston site for image). They suggest that the stretch near the cliffs is the Haaf Weg (the sea road) used to take the bodies of kings to Portencross for the journey to Iona where they would be buried. Clearly it is important that the harbour is confirmed if this stretch of road is to be proved Roman. If it is not, there could still be a line from Blackshaw Hill towards Largs. Wilson (2) looks at the possibility of a road from near Monktoun towards Kilmarnock noting the straightness of the turnpike to Spittalhill and the continuation of this alignment along a field boundary at NS402331 towards Stone Calsey (a name indicating a road). There may have been a road or even a line of march along the Cree Valley to the coast at Girvan where marching camps were found. This would have provided relatively easy access into Ayrshire from an area where it is known the Romans were and one of Scotland's oldest roads, The Path, runs through the area. Wilson (2) describes the route of The Path as coming up from Minigaff and Borland through the Glentrool Forest west of the Water of Minnock to the Nick O' the Balloch and then to Maybole and Ayr. It was the pre-turnpike route from Whithorn to Ayr. He suggests the Roman line would have been the Cree crossing at Machermore ford (NX413651), Challoch, Pennylane where there is a cross, Bargrennan, then east of the Duisk to Fardenreoch where there is another cross, then Pinwherry and Shalloch Park. St Joseph (20) discusses the possibility of a route to the east from the temporary camps at Girvan. This would have run through Old Dailly, then possibly on the line of an old estate road through Bargany. From there, the pre-turnpike follows this alignment to Maitland and the Kilkerran estate. It may then have made for Straiton and Dalmellington and Cumnock beyond. From there, the most likely route would have been to Glenbuck past Muirkirk on much the same line as the pre-turnpike shown by Roy. There is no definite evidence for such a road although some stretches of the pre-turnpike are quite straight (2). In 1939, Crawford and Davidson (21) suggested a road from Irvine to Barochan and Whitemoss, or perhaps Balmuildy. The line has not been determined but could have led from Kilwinning to the Lochwinnoch gap close to the present Dalry and Kilbirnie roads - geographically this is an obvious route. A number of Roman finds have been unearthed on native sites in the area. It would have crossed the Gryfe in Renfrewshire if heading for Barochan and Whitemoss, or the White Cart near to Paisley if heading for Balmuildy. Wilson (2) discusses two other possible routes, a direct one through Lugton and Uplawmoor and one through Stanecastle and Perceton to Stewarton and north through Causeyhead and Kingsford where there was a spittal in mediaeval times. There is a Cauldcotts further up this road over the border in Renfrewshire - as said, this placename, indicating a resting place for travellers, is thought by some to be associated with Roman roads. This was reported by Newall and Lonie (22) as running from near the fort to Muirkirk and beyond. It runs SW of Cairnsaigh Hill over the West Burn and the Avon towards Greystone Hill until it is finally lost in Slouch Moss. On this stretch, it is 21 foot wide with heavy kerbs, and a gravel and clay composition. It then ascends the shoulder of Bankend Rig to Bibblon Hill where red sandy clay rests on a terrace and is covered with a hard layer with a grey clay on top. From there it runs south of Bibblon Hill to the Polkebock Burn where there are vestigial bridge ramps and then to the Greenock Water west of Forkings. A farmer reported that a footway had been ploughed out in the 1950's and had exposed a 20-foot wide mound of grey clay with gravel hammered into the surface. This stretch now lies under the housing estate north of Muirkirk. After Muirkirk, it shoulders Pepper Hill and crosses the March Burn. From here, its course in Lanarkshire has been traced heading for Douglas and the general direction of Tinto. Parts of this route were examined by the Ordnance Survey but were not thought to be Roman (NMRS Number NS63NW29, NS63SE6). Newall and Lonie (23) reported the continuation of the road from Lowesmuir in the Avisyard area on a long route to the Doon Valley. It crosses the A76 half way between Cumnock and New Cumnock south west of Calton Farm, then through Polquhap towards the Black Loch. Interestingly it forms the parish boundary for over a mile so must have been obvious to those setting this out. It is about 12 metres wide here, with a bottoming of dark peaty clay then dark sandy earth with a topping of laminated crushed sandstone. It then skirts Carnwan Hill and the south of Cargailloch Hill where there is an accompanying hollow way. There is another hollow way further on, east of Linn Burn. There are no traces over Bedminnie Moss where it was probably corduroyed (formed by laying down tied bundles of twigs). Its course can be picked up further on, crossing Blueboots Burn and Burnockhead Wood, which prior to today's plantations was a boomerang shape just south of the farm, and then to the Black Water at NS512148. At this point, there is a clearly defined 17th century type holloway that follows the Roman road as far as Auchencloigh near to Old Polquhairn. This is probably the road shown on Armstrong's map running from Bank (present Bankglen on the New Cumnock - Dalmellington road) over to the present Littlemill. It has a heavy cobbled bottom with clay on top. The Ordnance Survey examined the area between Linn Burn and Auchencloigh but could find no evidence of a road, other than the holloway that they thought to be post-mediaeval (NMRS Number NS41NE 10). The road continues towards Rankinston to a ford over the Pow Burn at Ashentree. On this stretch of a mile or so, it is accompanied by a cobble-bottomed holloway. Beyond this point, traces are scanty but it appears to have made towards Holehouse, which is less than a mile from the River Doon where a Roman road is postulated. As it is only two miles from the stretch at Barshean Loch reported by Newall, (24) it may well be linked to this, which entails a continuous route from central Lanarkshire to Kirkmichael and beyond. Again, the Ordnance Survey could not accept this stretch to be a Roman road (NMRS Number NS41SW 12). It will be seen from the map how extensive a network is formed when all these proposed roads are taken into account yet as we saw only two have been proved. 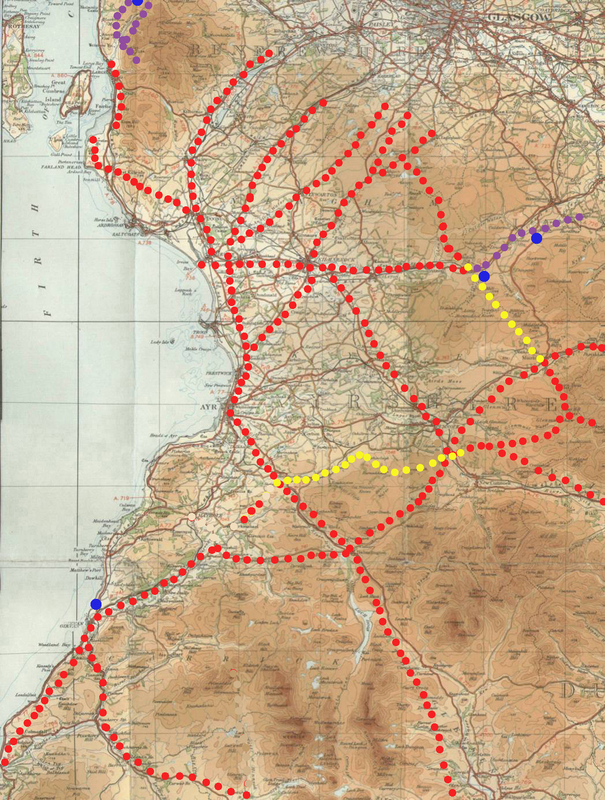 For all that, there are some possible roads which further work will help to clarify and there is a good likelihood that the map is a fair approximation to the lines of march taken by the Romans when they entered Ayrshire. The Discovery and Excavation in Scotland (DES) references below can be accessed here (see Ayrshire up to 1976 then Strathclyde Regional Council (Cunninghame, Kyle and Carrick, Cumnock and Doon Districts) up to 1995.